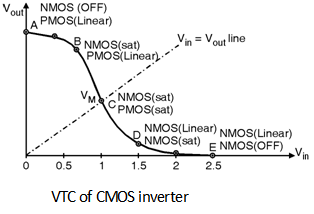 Voltage Transfer Characteristics of CMOS Inverter : A complementary CMOS inverter is implemented using a series connection of PMOS and NMOS transistor as shown in Figure below. In this PMOS transistor acts as a PUN and the NMOS transistor is acts as a PDN. In order to plot the DC transfer characteristics graphically, I-V characteristics of NMOS and PMOS transistors are superimposed such graphical representation is called as a load line plot. It requires that the I-V curves of the NMOS and PMOS devices are transformed onto a common co-ordinate set. Step 1 :	Write all the current and voltage relations for NMOS and PMOS transistors. Step 2 :	Transform IDSp Vs VDSp characteristics into IDSn Vs VDSp characteristics using Equation. Vout = VDD + VDSp . Step 5 : Merge IDSn Vs VDSn i.e. IDSn Vs Vout characteristics of NMOS and the IDSn Vs Vout characteristics transformed in step 4. (Refer Equation (7.5.1(d)). For the dc operating points the currents through the NMOS and PMOS devices must be equal and from the below Figure these points are for Vin = 0, 0.5, 1, 1.5, 2 and 2.5 V at these input voltages the IDSn = IDSp and these are the intersecting points of both IDSn Vs Vout and IDSp Vs Vout (i.e. transformed to IDSn Vs Vout) characteristics. 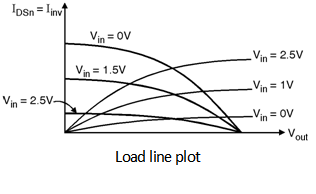 From these points now we can plot the voltage transfer characteristics as shown in below Figure with various regions. Before addressing the VTC in detail let us discuss the various operating modes of NMOS and PMOS transistors with respect to the applied input voltage these results are tabulated as shown in Table below. In this region the input voltage of inverter is in the range 0  Vin  VTHn. Hence the NMOS is in cut-off and PMOS is in linear region and output voltage is VDD. In this region VTHn  Vin < VDD2 in which p device is in linear region and n device is in saturation. Also, the factor n Cox WLn is also represented by n called as gain factor of NMOS transistor. This region is characterized by VDD2 < Vin  VDD + VTHp In this region PMOS transistor is in saturation and the NMOS transistor is operated in linear region. This region is described by the input voltage in the range Vin  VDD  VTHp. In this region PMOS transistor is OFF and the NMOS transistor is in linear mode. The output voltage in this region Vout = 0. From the detailed analysis of VTC characteristics it can be observed that, CMOS inverter has a very narrow transition zone. Therefore, high gain can be achieved when both NMOS and PMOS are simultaneously ON and operated in saturation. Thus, in transition region a small change in the input voltage results in a large output variations.